Ideally situated for touring Dumfries & Galloway. Craignair is a beautifully maintained and elegant Victorian sandstone villa, retaining many of its original features. You can be assured of a warm welcome and a pleasant stay with us. 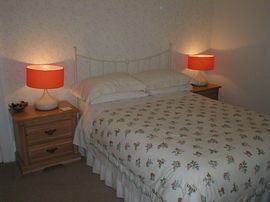 Our bedrooms are comfortable and tastefully decorated, all enjoying en-suite facilities. 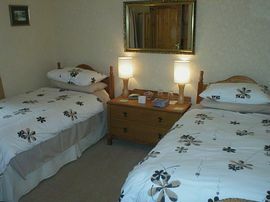 All of our rooms have TV, are double glazed and have individually controlled gas central heating. Tea and coffee making facilities are provided in each room, with a selection of herbal teas, hot chocolate and biscuits. 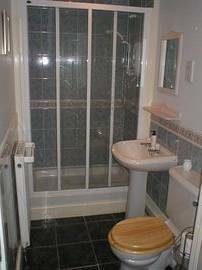 Hairdryers are provided for your use, and ironing facilities are available on request. Guests are provided with their own room key to ensure privacy. A selection of books and magazines are also provided for your perusal. 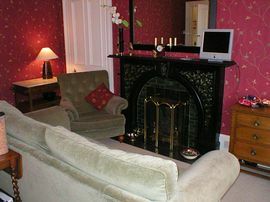 Our guests have the use of the TV lounge/dining room, which features an original Victorian fireplace. A full Scottish cooked breakfast is included, with a lighter option available as an alternative. A packed lunch can be prepared if required instead of breakfast. We also offer a selection of cereal, muesli and fresh fruit for your enjoyment. Off-street parking is available and secure storage is provided for bicycles and outdoor clothing and equipment. Drying facilities are available for the use of walkers and cyclists. Our bed and breakfast is located just a short walk from Dumfries railway station, and Dumfries town centre, and makes an ideal base for those wishing to explore Dumfries & Galloway. We are an ideal starting point for cyclists, walkers, motorcyclists, golfers and those wishing to trace their family history. 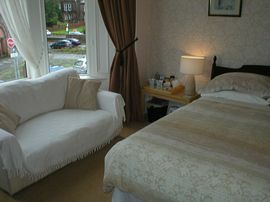 £25.00 per person per night includes full cooked Scottish breakfast. "Excellent, first class in every way." C. Lloyd, Hertfordshire. "Beautiful place, yummy food and really friendly host. Phillipines. "Beautiful house, very homely." Lloyd, Hertforshire. "Fantastic stay, great service, thank you." J. Thysson, Holland. "A lovely place to stay." C. McNeil, Auckland New Zealand.